...then get hold of this one! 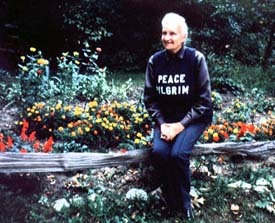 Peace Pilgrim, Her Life and Work in Her Own Words. Peace Pilrim (1908 – 1981), or Mildred Lisette Norman, was a deeply inspirational woman who gave up all her possessions and began a pilgrimage, walking across American in the name of peace. "I shall remain a wanderer until mankind has learned the ways of peace..."
She walked more than 25,000 miles, carrying in her blue tunic her only possessions. She crossed America for nearly three decades, bearing the simplest of messages: This is the way of peace-overcome evil with good, and falsehood with truth, and hatred with love. Peace Pilgrim talked about peace among nations, between people, and the most important Inner Peace. Penniless, walking with no organizational backing, Peace Pilgrim touched the lives and hearts of countless thousands of Americans. Some were charmed by her simple but cheerful presence; many others were profoundly inspired by her message and her remarkable lifestyle. She carried with her three peace petitions: one requesting immediate peace in Korea, one pleading for the establishment of a national Peace Department, and the third, directed to the U.N., seeking freedom for the world from the burden of armaments and, in its stead, the furthering of world prosperity. Signatures for these petitions that she and others collected were presented to the White House and the U.N. upon her arrival in the East Coast 11 months later. She didn't stop there. She kept on walking, criss-crossing the United States six times, walking for the rest of her life." "As I lived up to the highest light I had, higher and higher light came to me."